I have been lucky over the past two months to have a series of visits to view a wide array of items from the Cunard Archive, which is held in Special Collections at the University of Liverpool. Facilitated initially by their archivist Sian Wilks, who has now gone on maternity cover, I have been helped generously by their current archivist Beth Williams, who initially put together a comprehensive collection of all items relating to transatlantic Cunard liners between the UK and North America during the 1930’s. This has taken me three full days to look through each item, and I will also return to view more of their specialist books on the history of Cunard and the transatlantic liners and cruising. Special Collections at the University of Liverpool holds a wide range of archival collections which can be viewed by the general public if arranged in advance. The archivist and reception staff are incredibly helpful and take great care in looking after all items and advising you on how best to handle them. 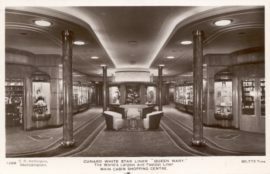 On my first visit, I predominantly selected items from the PR department, so therefore items that had strong visual content and showed the interiors and way in which the ocean liners were promoted to the public. The Cunard Archive also holds business records and passenger lists, which although are interesting, are of less importance to my research interests. I was mainly interested in the liners Queen Mary and Queen Elizabeth, however there were a wide range of liners travelling transatlantic routes in the 1930’s that I was previously unaware of. I accessed a large amount of original photographs used for promotion and documentation of the liners. 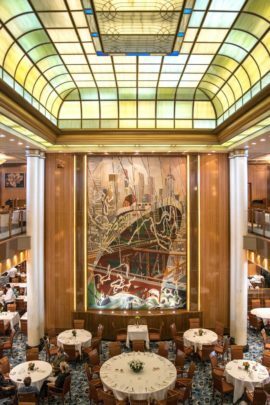 The first collections were of the Mauretania and Aquitania, which showed salons, dining rooms, decks and bars for the third and tourist classes, as well as portraits and group shots of the traveler’s. The fashions, even in the lower classes were so synonymous with what we know of the era – cloche hats, drop waist skirts with pleats at the bottom. Despite being the cheapest areas to travel, the interiors were still very stately, with palms and marbled floors. Original photographs of the maiden voyage launches were also made available for the Queen Mary and Queen Elizabeth. The scale of the event and the thousands of people (all wearing hats!) watching the launch were quite incredible, which was also heightened by the presence of royalty at each event. Her Majesty the Queen and the Royal Princess watched the launch of the Queen Elizabeth in 1938. One of the highlights from my first visit was a letter written from the Saxonia on a transatlantic crossing from to New York in February 1921. The writer, Jack, a male passenger wrote to his dear mother and brother. He writes about life on board, complaining at first about the passengers and how boring it is, to lastly after several days comparing them to a family and how wonderful the experience has been. He discusses the entertainment and includes a song about the Saxonia which was sung on board, as well as the extensive food at each meal. Jack writes, “I’m sure to make your mouth water but this is what I just had for dinner:- Soup, Salmon, Mutton Fillet, Roast Turkey, Sausages etc, Christmas Pudding, Chocolate Wafers, Coffee and Liquers”. On the back on the letter, it is noted that Jack sadly passed away several years later in a house fire in New York City. “The lines of the symmetrical hull, the enormous raking funnels, the tapering masts, and the white upper works and ventilators, and the graceful way in which she sits upon the water, gives this ship the appearance of a colossal yacht”. “This great power and high speed is mainly responsible for the extreme regularity with which in summer and winter alike, she makes her voyages, passengers being able to reckon with tolerable certainty on the time of arrival”. There is a really interesting booklet in their collection from the 1930’s that demonstrates the mammoth scale of the ships through illustrations placing the ships against buildings such as the Coliseum in Rome and the British House of Parliament. The ships mainly eclipse these mammoth architectural structures. In other booklets I read, the Queen Mary was described as being taller than Niagara Falls and able to travel the Atlantic in 4 days. Other statistics explain the scale of the ships operation – 1300 travelers in 3rd class, 500 in 2nd Class and 500 in 1st Class. Staff numbers also demonstrate the gigantic scale of this operation – 50 cooks, 350 stewards, 390 engineers and 70 members of the sailing department on one ship alone. This experience was an absolute delight, and I felt so lucky to be able to view them. 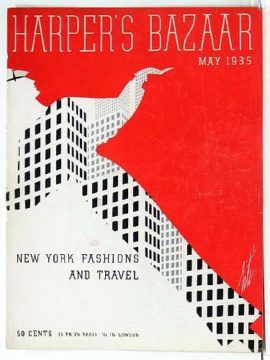 Again after a complex online booking and registration process in person, I spent two days looking through pretty much every Harper’s Bazaar of the 1930s, bar one or two bound collections. The design of the magazines significantly felt a lot more ‘modern’ in layout, composition and content than the Vogue magazines from the same decade. This was perhaps as less e were produced per year than Vogue. Again, unfortunately due to signing a copyright form I cannot share images of the insides of the magazines but they were just beautiful objects. I have used for images, some slightly similar front covers from US editions that are widely available online. The front covers especially were incredibly crafted works of art, predominantly created from hand drawn and printed imagery, very bold with colours and form, presumably designed to create impact on a newsstand. In many of the editions throughout the year, there are colour and black and white hand drawn illustrations of fashion for liners, beach, ‘outdoor days’ and summer sports, all the while encouraged to looking floating and glamorous. Women’s hair was kept short and stylised. As the decade moved on, the layout of the illustration became even more experimental. 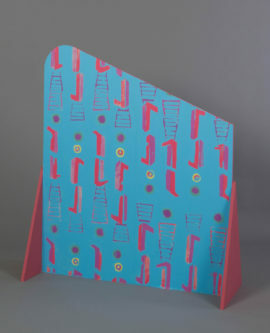 New fabrics for home or fashion were presented in cut out shapes creating an abstract scene. Fonts used are open and thin, synonymous with thirties graphics. 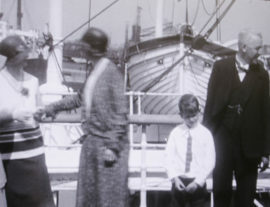 Cruise or ocean liner wear is also featured in photo shoots set on deck, ranging from bathing wear to more formal dress. Up market department stores such as Fortnum and Mason and Jenner’s are commonplace and these often feature clothes for wearing on liners. The healthy, idealised, streamlined body is often featured in other illustrations, whether playing tennis, diving or exercising, and articles on keeping fit are featured often. There are also some wonderful articles with images of real homes with modernist interiors with soft furnishings. Additionally some photo shoots are shot in black and white in created environments with steps, archways and doorways, how I would love to view these in real life! I would love to create my own environments and photography shoots with objects, perhaps using sculptural and printed fabrics. The titles of the articles are also interesting and something I would like to work with, as well as the collage style approach to layout and making. So may ideas percolating! 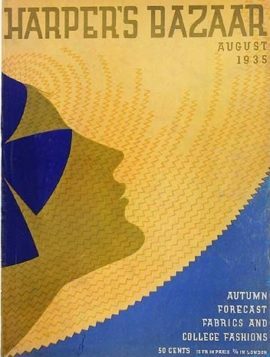 Thanks to the expert knowledge of Uthra Rajgopal, Assistant Curator in Textiles and Wallpaper at the Whitworth Art Gallery, I was told about 1930’s fashion magazines such as Vogue and Harper’s Bazaar, and how they often featured cruise liner wear and advertisements related to life on board. I thought this idealised imagery and clothing could be interesting and useful to look at considering that wellbeing and exercise on board was a crucial aspect of how transatlantic travel was marketed to the wider public. 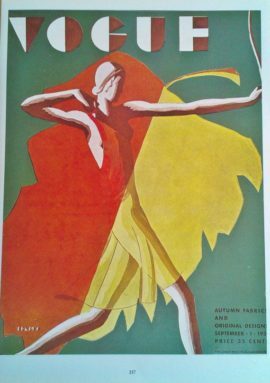 Original copies of Vogue magazines from the 1930’s are available to view by prior appointment at the National Art Library, which is situated within the Victoria and Albert Museum. I will admit the process to book viewing the objects was quite complicated online, and involved a few phone calls to check that the items had indeed been ordered and would be ready during my visit from Manchester. The National Art Library itself is a magnificent space, and anyone can become a member (this was also required to view the items) to use the space there for work or research. I even celeb spotted Lloyd Grossman, my second spotting of him in London – I saw him in Bond Street, the first week I moved there in 2005! 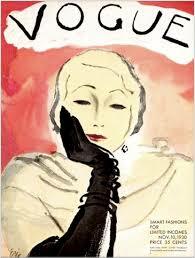 I selected nine copies of Vogue from the 1930’s across the decade, selecting a mixture of spring, summer and winter. I knew that cruise liner wear was also featured in winter editions for winter cruising. Each magazine was bound within a large book of copies of magazines from half the year, so I was actually able to view about half of the decade’s copies from the 1930s by selecting across the 10 year period– lucky me! 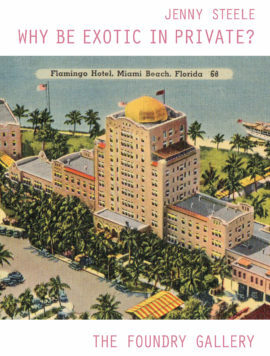 The first item I viewed was June 24th, 1931, and it included a mixture of travel features and summer sales. This pattern continued throughout the decade, with winter cruising outfits in the winter months, and clothing articles mid year in advance of summer travels on sea. The Vogue magazine obviously was aimed at an upper middle class audience, although there were some features on shopping on a smaller budget, or a limited income as they described it. Due to a copyright agreement, I cannot share images of my photographs of the magazines I took, which as always is a shame, as they are just so incredible. Illustrations were a mixture of predominantly hand drawn, and a few photo shoots. The content of magazines was a little more basic than I had envisaged, and there was a large amounts of advertisements for beauty products that sounded highly questionable, such as creams and basic plastic surgery procedures. The magazines also contained most months a pattern book of designs, which also included a series on cruise liner wear, which women could select an outfit from and send off to receive the pattern in the post. The clothing for ocean and cruise liners was often featured alongside clothing for other leisure pursuits such as driving, walking, going to the races (although this was much more formal) and visiting more local exoticised places, such as Scotland. Each issue also featured advertisements for Dorville fashions, which I had never come across before but seemed to cater highly to leisure and cruise liner wear, as was available in most department stores, such as Debenhams. 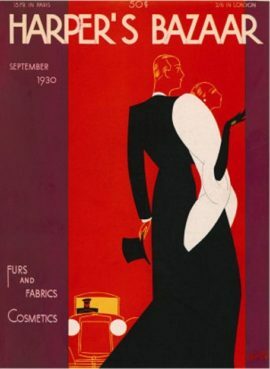 *Please note images below are from US copies of Vogue from 1930’s period. Despite being based in Manchester for 6 years, I had never visited the North West Film Archive until recently. Set up in 1977, the Archive preserves moving images made in or about Greater Manchester, Lancashire, Cheshire, Merseyside and Cumbria and offers a variety of access services to users in the public, academic and commercial sectors. The North West Film Archive is part of Library Services Special Collections at Manchester Metropolitan University, but accessed at Manchester Central Library. 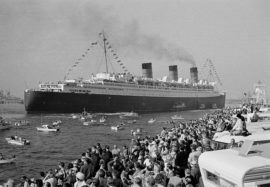 In discussions whilst planning this project, I was advised that they may have some films of ocean liners from the 1930s. In advance from their website, I identified ten silent films, predominantly in black and white of films of the transatlantic route, and embarking and disembarking on either side. Geoff Senior from the archive was incredibly helpful in sourcing the items and also transferring some to DVD so I could watch them over two visits. The first film I viewed in their viewing booth at Manchester Central Library was Cunard to Canada (1927). The film is punctuated with information graphics that are created by showing a typed message on the screen, and the words stay on screen for a long time so that everyone can read them. It’s an interesting and basic way to create a minimal but clear narrative. This film focuses partly on third class passengers (the cheapest tickets) and their experiences leaving the port, as well as staff such as waiters and chefs. 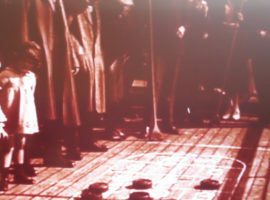 The film pans onto travellers drinking tea and coffee on the deck, as well as playing games such as ‘deck tennis’ and ‘shuffleboard’, as well as dancing – ‘a pleasant outdoor dance enjoyed by old and young’. We are given access to the daily routines on board, most which encourage health and well being. The day starts with a morning cup of broth on deck, tennis late morning and afternoon tea on deck, all which happen facing the sea water. The film also gives in depth access to extensive bake shops, kitchens, pantries and areas for stewards and housekeeping. Also, very interestingly, it shows the print room of the ‘Atlantic Daily Mail’, the daily paper created mid ocean through letter press printing. 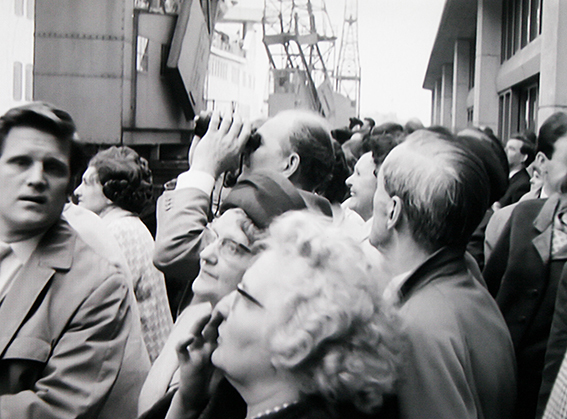 As the ship arrives towards Southampton, the passengers get the ‘first glimpse of the old country’. Passengers were a mixture of tourists coming from Europe, emigrants (this was lessening significantly around this time due to new laws) and Canadian citizens visiting their ‘old country’. A Day in Liverpool (1929), produced by the Liverpool Organisation, is a long film of just under one hour, that documents a working day on Liverpool docks, showing everyday practices and relating it to Liverpool as an internationally serving commercial port. The film features the overhead and underground railways that I have read about that powers the local businesses. Statistics are shared such as ’10 million of timber enters the port of Liverpool every year’, and informing us that port is a trading place of ‘cattle and frozen meat from British Dominions’ – so much of the shipping wealth due to Britain’s history as colonial power. 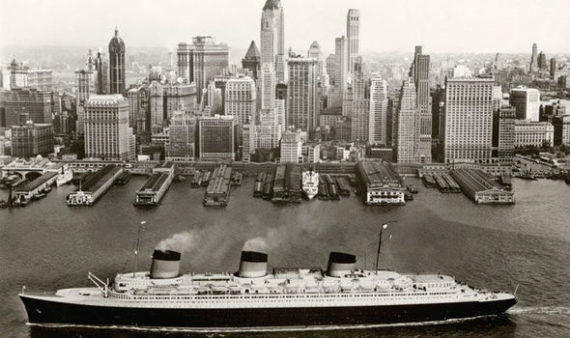 During the day, a White Star Liner arrives from New York with imports such as cars coming off the boat. The film also shows some of the prestigious, classical architecture in Liverpool, like the The Walker Art Gallery. At 5pm sharp, the day’s work is done. During the entire film, I noticed that nearly every working person in the film wore a hat all day. The Royal Mail Line – Leaving Asturias focuses more on the leisure time spent at sea as traveller’s journey on ocean liners to Spain, Madeira and the Canary Islands. The daily life at sea features sunning themselves on deck and playing games with hoops. The fashion, of the seemingly more upper class traveller’s is very stylised. Women have short cropped hair and wear drop waisted dresses and swimwear. As the women swim in the on deck pool, men look on admiringly and quite creepily. Views of Liners Cedric and Brittanic follow a family from Stockport boarding the Brittanic at Liverpool for New York on its maiden voyage. The ship is dressed appropriately for its special occasion, covered in flags and bunting, and the dock is packed with well-wishers waving it off. Again the female fashion is reminiscent of what I identify as thirties style – fur collars, cloche hats and drop-waisted coats. The Glengarry Cinema Topical Newsreels No 8 also cover the maiden voyage of the Brittanic, with tug boats to the front and rear of the ship, and strings of flags and hoards of people waiting in Liverpool to wave it off. In the Glengarry Local Newsreel (1929) White Star Liner Albertic is also filmed leaving Liverpool, which has another great feeling of collective celebration for those on land and onboard. The New World Wonder Tunnel in Merseyside is opened by King George IV in 1934, and filmed in the Glengarry Topical News No.17. 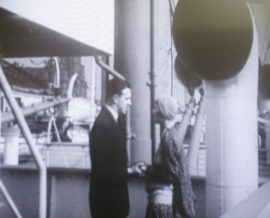 One of the most personal films I viewed on the first visit was A Trip to America (1937) where Mr and Mrs Hindley, a seemingly wealthy couple travelled to USA on an ocean liner. There is ample footage of the open sea and the approach to New York as you view the Statue of Liberty for the first time. The film shares them walking through New York streets during their visit. 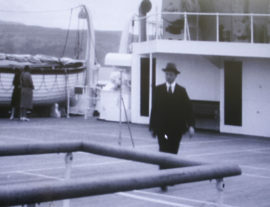 The 1932 film Sunshine, Sea Breezes and Strange Places on the Lancastria shows more of life on board – the entertainment, games such as boules and exercise classes on deck, all performed in the seafaring fashion of wide brimmed hats, tighter tops and wide trousers. Jenny Steele is a Scottish artist who lives and works in Manchester. 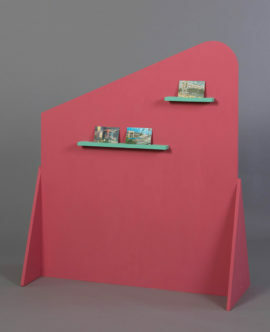 Her work spans across drawing, sculpture, decoration and installation but always with a focus on architecture. Steele is fascinated in the idea of architecture as a stage set for extraordinary activities and encounters with her work referencing twentieth century interwar seaside architecture. Steele has created a ‘mis-en-scene’ a total work of art where she has drawn on the architectural ideas of Morris Lapidus who declared architecture as a movie set where the guest took on the role of an actor and the artist Marc Camille Chaimowicz who plays with he ideas of art, decor and domestic environments. 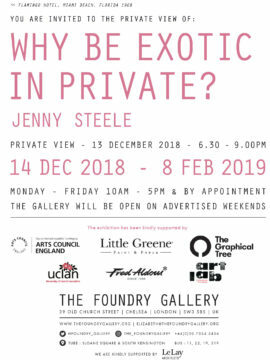 Steele has carefully considered the fabric of the gallery as an integral part of her immersive artwork creating an exhibition which considers not only the surface of the walls but also the gallery’s large windows.The walls have been painted in a pastel colour palette with paint from ‘Little Greene Paint Company’ and to frame the gallery’s large front windows a faux jungle of pals and foliage, printed by ‘The Graphical Tree’ have been installed. The window is reminiscent of the 1920’s staged tropical garden in Miami’s Lincoln Road Mall which you were not allowed to enter, you simply had to stand outside and gaze in at this exotic private world. 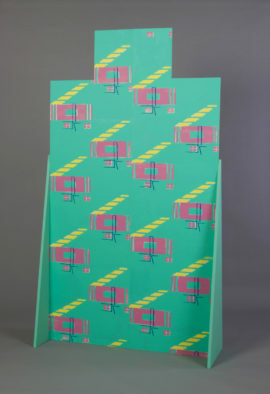 Steele’s work demonstrates a refined graphic sensibility and a sensitive use of colour. The way she works challenges the categorical divisions that exist between art, design and decor as she moves effortlessly between them. 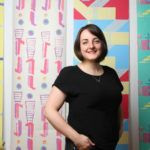 By exploring the formal and decorative aspects of architecture throughout he means of drawing, painting and printmaking she has developed a strong visual language that explores the very spaces between art, life and decoration.